I think I have a cover, so that ain’t bad – now I just need content! 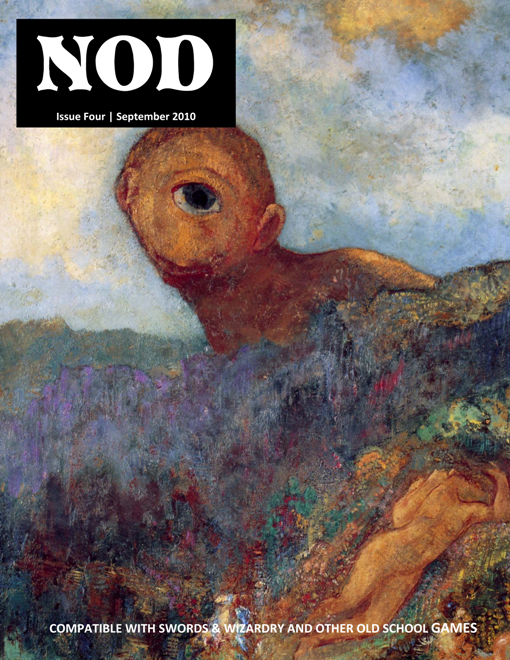 The cover image is a cyclops painted by Odilon Redon, a French symbolist painter who, it can safely be said, did not foresee his work appearing on the cover a RPG supplement. I’m also including two medium-sized dungeon crawls – The Ruins of Timulus and the Pleasure Palace of Izrigul, both located in the Eastern Venatia sandbox. I’m hoping to get this thing out by Sept 2 before I take a mini-vacation to the land of my ancestors – Ottumwa IA. Should probably clock in at 110-120 pages. I've always loved that painting, nice choice. Consider me one guaranteed sale – still working my way through issues one to three. Is Mystery Men still going to be in there, as that tickled a particular fancy of mine (what with me liking them super-heroes and all!)? Any plans to put all the books together into one big megabook? Very pretty – I'll be buying! I think Mystery Men will have to wait until #5 – the city-state issues usually need more articles. However, since you requested it, I'll post it on the blog over the weekend with one request – does anyone know where I can find some public domain superhero art – just a single, simple B&W image I can use to illustrate the article? Megabook – I might have plans for that, yes. I'm thinking about doing some yearbooks to collect articles for players and referees, so a megabook covering an entire region is not out of the question. Time will tell – right now I'm focused on producing three more issues of NOD this year and publishing the basic version of PARS FORTUNA. Acrobatic Flea – thank you sir! That wiki hits the spot. I might go ahead and convert some of those public domain heroes using my little system – heck, one image I just found might just be the cover of NOD #5!